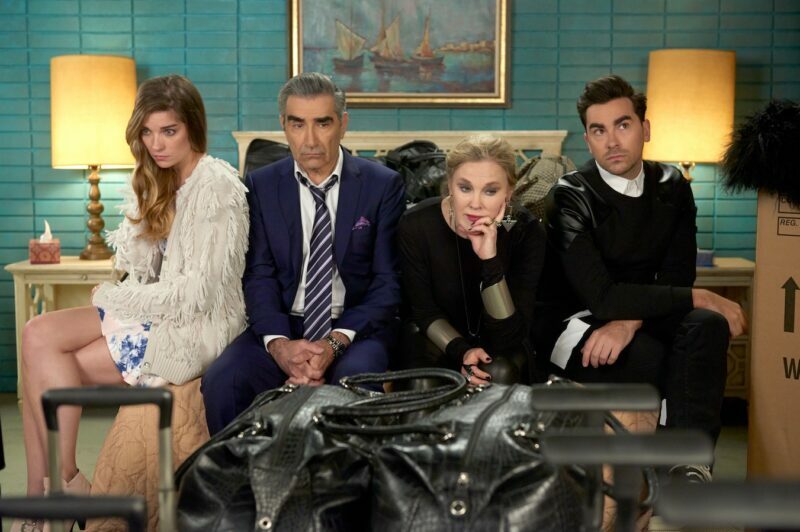 Dan and Eugene Levy have officially announced that Schitt’s Creek will have a sixth and final season. Schitt’s Creek is a Canadian television show that airs on Pop, lovingly created by Dan Levy, alongside his comedic genius father, Eugene Levy. It tells the story of the very wealthy Rose family and their sudden descent into middle to lower class lifestyle when they are duped by their business manager. Luckily, they are able to detain a small town that Johnny Rose (Eugene Levy) bought for his son David (Dan Levy): Schitt’s Creek. For the past five years, the antics of the Rose family- along with other quirky characters that live in Schitt’s Creek- have entertained the masses with delightfully progressive and inclusive issues intertwined with perfect comedic timing. Alongside the Levy duo, the incomparable Catherine O’Hara plays Moira Rose, matriarch of the Rose family, and their daughter, Alexis Rose, is played by Annie Murphy. The cast is rounded out with Eugene’s daughter, Sarah Levy, playing the kind-hearted and somewhat spacey waitress Twyla, Emily Hampshire plays the deadpan motel owner/David’s best friend Stevie, Noah Reid as David’s loving boyfriend Patrick, and Dustin Milligan as Alexis’s boyfriend Ted. While I cannot properly put into words at this time how bittersweet this announcement is, I think I speak for all Schitt’s Creek fans when I say: Thank you, Roses, for all the laughs and life lessons. Thank you for showing us that inclusiveness wins. You will be incredibly missed. The first four seasons of Schitt’s Creek are available on Netflix.